It has been a while since my last KLM review back in 2016. During 2017 I flew KLM a few times across Europe and was lucky enough to be booked in business class too. 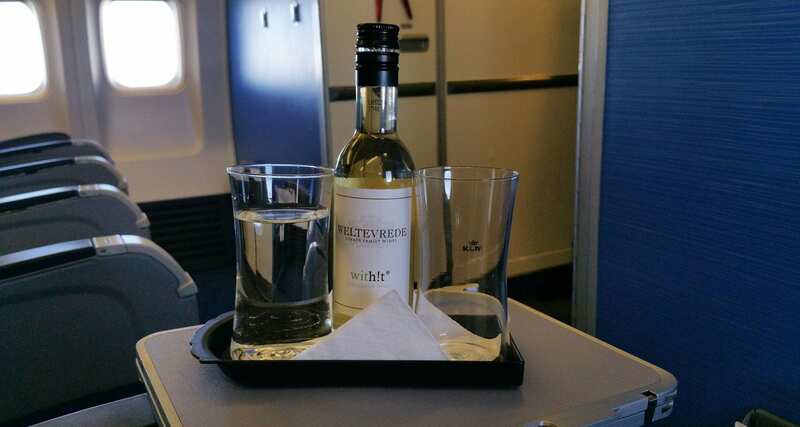 I love KLM; they collaborate with some well-established brands and restaurants to create some fantastic products in their business class cabin. More importantly, the crew are always lovely, friendly and very down to earth. A very early start on this service from Amsterdam to Paris, while a rather short flight with a very busy business class cabin, the crew managed to serve everyone with ease. 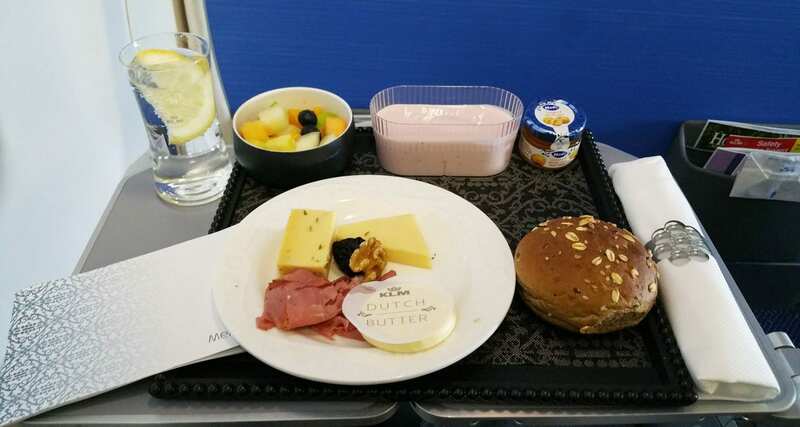 A light breakfast on KLM in business class consisting of Yoghurt, Fresh Fruit, Jam, Cumin cheese, Beemster cheese and Sliced pastrami. For such a short flight time, it was perfect. Starter: Pearl pasta with dried Angus beef. Main: Tandoori salmon with coconut rice and cilantro beans. Some Dutch cheese on the side and a very delicious raspberry chocolate dessert. A fantastic meal, probably one of the better business class meals I’ve eaten on long journeys in Europe. Well, I’m just making up that title, but this flight wasn’t 3 hours, it was under 2 hours, so I wasn’t expecting a full hot meal service. But it was probably the most enjoyable of all my flights with KLM. I was flying from Vienna to Amsterdam and had a thru connection the following day to my final destination. I was the only passenger in business class, so the purser was very attentive. She started to ask about my connection and my travel plans and then noticed I was taking a lot of photos. She was curious why someone would want to photograph the airline food offering (I still wonder today why I am obsessed with airlines and their meal concepts!) I explained what I do, and she was genuinely interested. She then offered to bring me another meal tray (from a previous flight) for additional photos; she then came out with extra snacks and wine. How lovely was she? Entree: Oriental style beetroot salad with smoked trout and muhammara. Followed by a Gem salad with sesame chicken skewer, boiled egg, tomato and pine nuts. For dessert a Yuzu citrus mousse. It was a very fresh tasting, perfect meal. Pretty much the same main (although I think the chicken was flavoured differently) the salad was more tomato based, and the dessert was a chocolate cake. Sure why not, and what a lovely little wine and glass holder! Again, why not. I do love Stroopwafels, but these Stroopkoekje are slightly different. First created in 1945 by Bertus Punselie from Gouda, these cookies are somewhat thicker than a Stroopwafel and have a lovely filling. 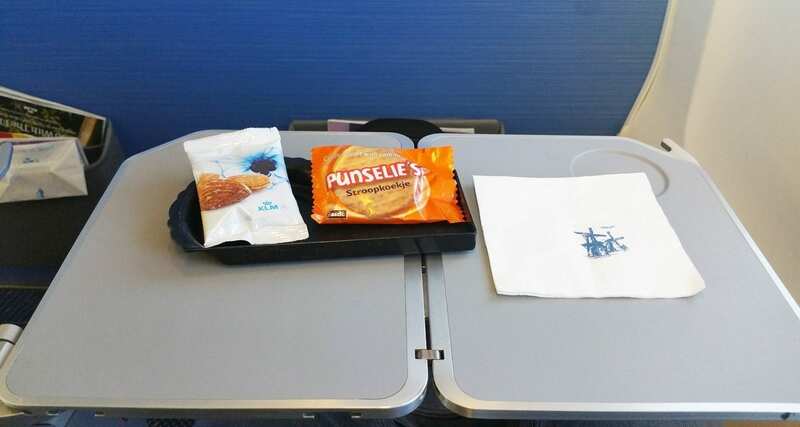 Some great meal experiences with KLM, I enjoy flying with them, the next product I want to review from KLM is the pre-order upgrade meals for economy class passengers.